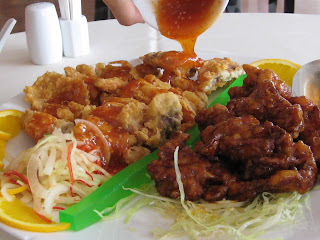 A recent trip to Johor Bahru means lunch with an old friend who is a good cook and an ardent food lover. We had lunch at Danga Palace. 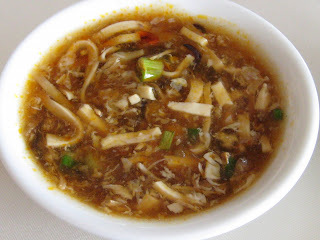 The Sichuan Hot & Sour Soup was notable in which the sour, spicy and saltiness are well-balanced. It was also brimming with goodies - strands of soft beancurd, wood ear fungus, bamboo shoot, etc. We ordered a chicken dish prepared in two ways - one with a piquant Thai-style sauce while the other coated in Marmite. Again the harmonious blend of flavours made the dish truly memorable. The latter was outstanding as the batter coating was thoroughly imbued with the Marmite sauce. The other dishes we had were Stir-fried Kai Lan and a simple Beancurd dish. Later as we were wandering around JB, we stumbled upon an old bakery which has a 66-year old oven. They sell the real Roti Bengali that is popularly used for thick Hainanese toast, butter rolls, curry puffs and rounds of butter pastry. We bought one of their chicken curry puffs - the flaky pastry tasted richly of butter and the filling had a surprisingly generous amount of diced chicken meat. Too bad I forgot to snap a pix before it was devoured! For dinner, we drove to Singapore. Found this decent Prawn Noodles with Pork Ribs in Chinatown. Quite different from our Malaysian version but it was tasty nonetheless. I luuuurrrvvve the soup - thank goodness it wasn't MSG-laden or else I would have suffered the consequences! 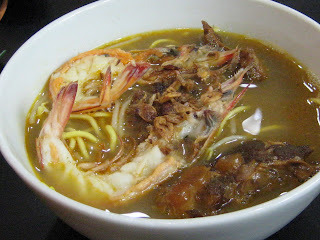 Its hearty sweetness probably stemmed from the prawns and pork in it. Speaking of which, the pork ribs were equally nice and tender. Even the soft bones are edible with a nice crunch to them. 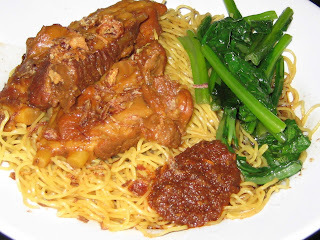 Hubby's Pork Rib Wantan Mee also came up to mark. In fact, it was better than some local ones from our "instant hawkers" here. It certainly put paid to our old presumption that Singapore-style wantan mee is weird and laden with tomato sauce. Well, not anymore. And if we Malaysians aren't careful their hawkers may just beat ours one day. Prices were another surprise - let's not do the currency conversion ok. Dollar for dollar, mine costs S$4 and hubby's S$3 for ours were small portions. 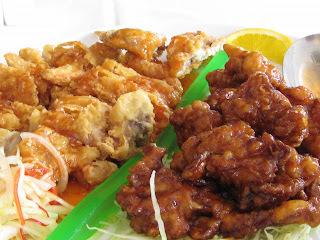 I can't imagine us getting such decent food nowadays in KL...not when big prawn and pork ribs are concerned. 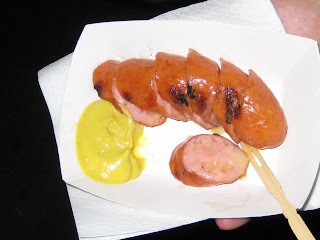 Other goodies which we had during our Chinatown jaunt included this German cheese sausage with mustard, a durian cendol (better than average which again was unexpected) and some roasted chestnuts (fresh, fresh, fresh without any badly shrivelled up ones like I sometimes get when I buy them in KL). The following morning I had a most delicious kon lou (dry toss) meehoon with minced pork, pork and fish balls, sliced fish cake and deep-fried lard dices! Even the soup came with chopped seaweed which lent so much flavour. I can't get over the fact that I only paid S$2.20 for it! All in all, it has been quite a revelation. It looks like their street food is fast gaining on us. Not a threat yet but if we are not careful, they will be. Enroute back to KL, we stopped by the Machap rest area for a quick bite. Since I didn't have lunch, I grabbed a packet of Nasi Ambeng. 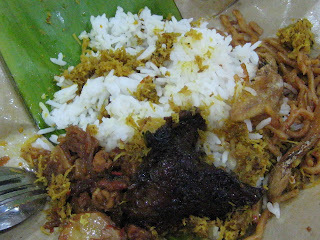 This is Johor's equivalent to Nasi Lemak. A Malay friend told me it's a Javanese speciality usually served at weddings and auspicious kenduri or celebratory feasts. CHOC MUFFINS THAT TAKE THE CAKE!